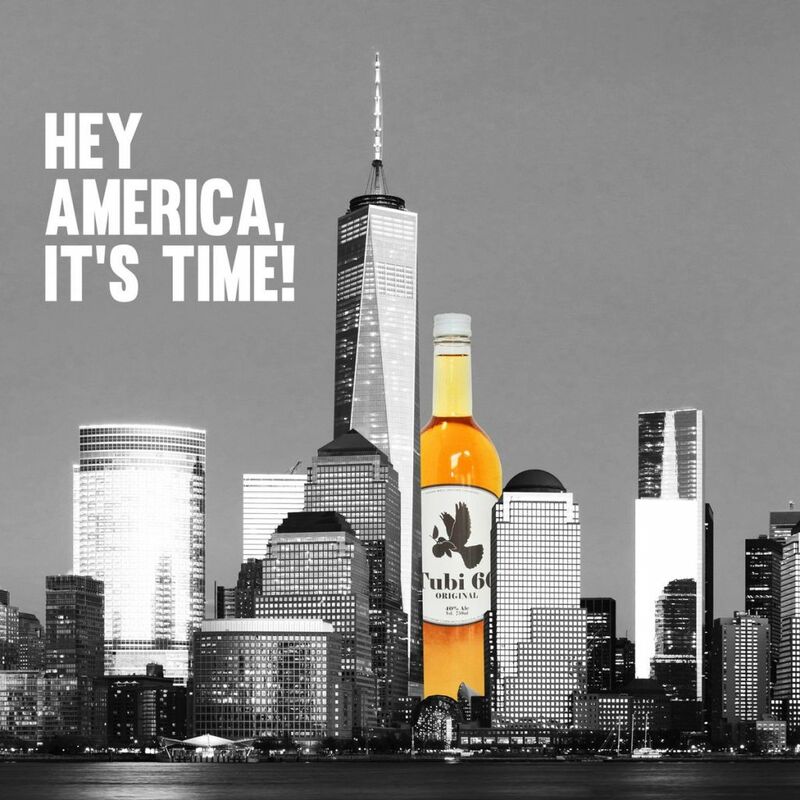 To help celebrate Israel’s Independence Day, why not try Sabra-made spirit Tubi 60, an Israeli-made alcoholic drink with a secret mix of ingredients that was first made popular by Israeli hipsters. While this honey-colored libation first became popular with the twentysomething crowd, it’s now going mainstream and will soon be found on liquor shelves in Texas, Brooklyn, Oslo and Berlin. But don’t ask what’s in it because no one will tell you. They don’t actually know. What Hilal Tubi — one-half of the Tubi brother pair who created the eponymous drink, named for their family and the 60-some herbs and fruit essences contained inside — will say, is that it’s an 80-proof spirit that packs quite a punch and is fully approved by Israel’s Health Ministry. He won’t say what it is distilled from, although according to one Brooklyn liquor store, the vegan drink is crafted from corn-neutral spirits macerated with lemons, ginger, turmeric, clove, cumin, saffron, anise and mint. 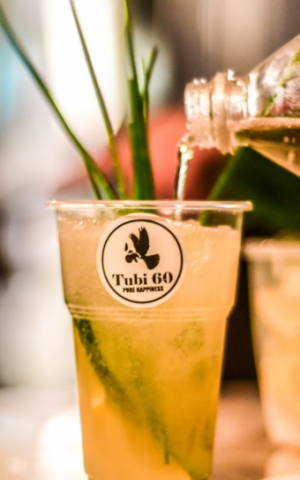 Fans of Tubi 60 like to say that it takes less Tubi 60 to achieve the same effect of other alcoholic drinks. It is incredibly potent, and even a few sips of a Tubi 60 cocktail creates that hazy feeling usually felt after more than one or two hard drinks. Which may be why this lemony moonshine is not to everyone’s taste. Tubi, 34, with his younger brother, Yanai, 23, created the herbal spirit that is tangibly different from the drinks usually available at most bars and clubs. The brothers said they wanted something better, a spirit with flavor, and so they turned to higher-quality, more natural ingredients. The two began working on their secret elixir in their family’s apartment. Neither of the brothers were bartenders or even particularly sophisticated drinkers. Hilal Tubi used to be a vodka and Arak drinker, and initially knew very little about the process of distilling ethanol produced by fermenting grain, fruit or vegetables. His younger brother, Yanai, was just out of the army when they began working together. They learned about the distilling process, mostly through experimentation, testing their creation repeatedly and consulting with food technologists who readily shared their advice about how to maximize taste and the drink experience. The Tubis won’t divulge the exact ingredients of their artisanal elixir, except to repeat what’s written on the label — that it is all-natural, gluten-free and vegan, crafted from spirits macerated with various herbs and spices, and intended to leave drinkers without a hangover the morning after. Meanwhile, the Tubis’ friends began drinking it, and sharing it with their friends. 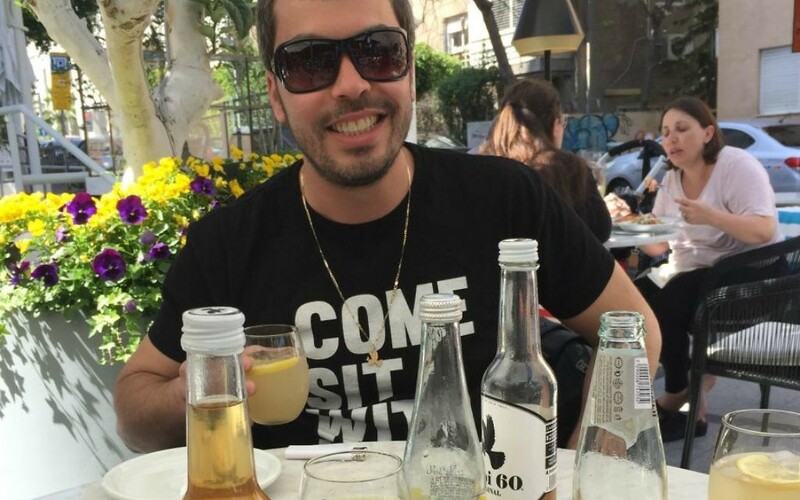 From north to south, the Tubi brothers would drive their bottles around the country, corresponding with fans mostly via their active Tubi 60 Facebook page and finding fellow Tubi 60 drinkers in tiny moshav bars or town pubs. Not everyone was excited about the mysterious spirit from the start. Haifa bartender Andrey Taki Frenkel said he was “very skeptical” about Tubi 60 when he first heard of it. He had just come back from a year in Moscow, and all his friends were talking about it, said Taki Frenkel, who also owns Six O’Clock, a bar consulting company. Around the same time, there was a wave of negative publicity and press about the drink, questioning what it contained that it made it so potent. 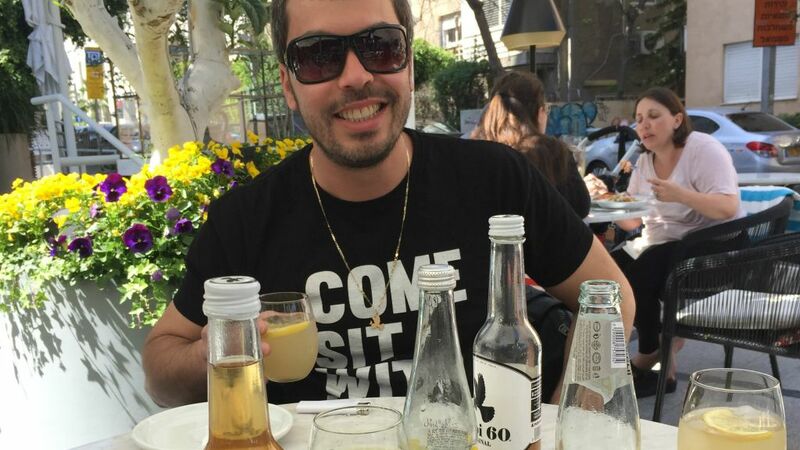 “When you hear it’s made in some apartment in Haifa, you do get skeptical,” he said, adding that some of the major spirits suppliers in Israel were working against Tubi 60 and its initial success. Bars stopped serving Tubi 60 for a period, said Taki Frenkel, asking more questions about its ingredients. Around the same time, the Tubi brothers moved out of their apartment distillery, and began producing their mysterious moonshine under proper conditions in a Haifa warehouse, publicizing their Ministry of Health food service license. That’s probably what made it so popular among the younger crowd that is often looking for drinks that get them drunk, fast. The Tubis expanded into the Tel Aviv bar scene in 2014, and were selling Tubi 60 throughout Israel by the end of that year. 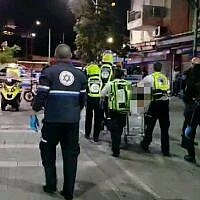 The spirit experienced that first, initial wave of success because of good timing, said one Tel Aviv bartender, who preferred to remain anonymous. Taxes were high on imported alcohol at the time, and Tubi 60 was cheap and very available. Part of the charm of the artisanal drink was a certain sense of intimacy, of being the drink popular among young Israelis, known for its very dominant, light lemony flavor that didn’t taste quite like anything else. Kathryn Loeffler, a Tubi 60 fan and former Deloitte consultant from Austin, Texas, now heads the company’s US operations, through Tex Avivi Importers, working on exporting the spirit into the American market. She ended up living in Israel on a whim, and stumbled upon Tubi, which became wrapped up in her love for Israel. “Tubi has this rare and special ability to inspire an ambassadorial attitude in people that centers around sharing and that’s what happened to me,” said Loeffler. After meeting with Hilal Tubi, Loeffler worked for a year getting the necessary permissions to sell Tubi 60 abroad; Tubi 60 is now sold online in Spec’s, a wine and spirits store and website based in Texas, and is now being sold in Brooklyn, as well. Americans like it, said Loeffler, and in Austin, where she first imported it, creative bartenders introduced it to the craft cocktail scene, putting it on brunch menus, mixing it with Champagne, making drinks with mezcal and whiskey. “I always tell people it’s a paintbrush and up to them where they take it,” said Loeffler, who likes to drink Tubi with Topo Chico, a Mexican sparkling water similar to club soda. Exports to Oslo, Norway, will follow the US launch and then Berlin, home to many expat Israelis who often smuggle bottles of Tubi 60 in their suitcases. The fledgling spirit company wants to support the arts and its own patrons with the Tubi Pop Art Gala, an exhibit of local artists creating their own take on Tubi Spring for a Pop Art exhibition to be held in the Florentin neighborhood of Tel Aviv. Aspiring artists should go to the Tubi 60 Facebook page to apply and the opening evening of the event will be on May 18, with free Tubi 60 cocktails to celebrate, and a closing event on May 25.